Jodi Farrin received her Bachelor of Science from Simmons College in 1988. For several years she worked with pro athletes of the New England Patriots and New England Revolution. In the past 20 years she has specialized in pediatrics with a sub specialty in the performance and psychology of the adolescent athlete. 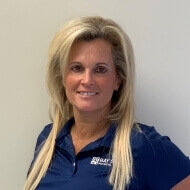 She has worked closely with members of competitive elite cheerleading and gymnastic teams, and developed preventive conditioning programs for them. She has undergone specialty training in Neurodevelopmental Treatment Technique to allow her to treat children with diagnoses of Cerebral Palsy, Muscular Dystrophy and developmental delays. Jodi treats patients in the clinic Monday through Friday. On a personal level, she is a mother of 5 children. She enjoys the sports of tennis and running, and has trained with members of the Boston Marathon.